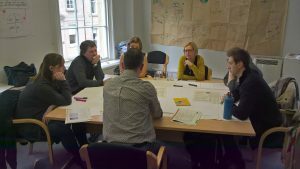 Project outline: In 2016 I was asked to contribute to the Improvement component of the Management Essentials training course in NHS Health Scotland. This is a holistic 12-month development programme for managers, providing a range of developmental and learning opportunities for each cohort, as well as a strong peer support element. I was initially asked to be part of the steering group for the programme in order to bring my experience as a previous cohort member to the group, but was also keen to ensure that the value of knowledge to improvement work was highlighted and reflected in this module. I was therefore asked to co-develop and co-deliver the 3-day improvement module along with two other colleagues in our Strategy and Health Equity directorates. Having undertaken the training programme previously, I had some experience of improvement techniques and approaches, and I had also developed further knowledge and understanding through involvement in in-house improvement projects. It was still a steep learning curve however, and I was very grateful for the knowledge of improvement techniques and course design which my co-presenters brought to the project. We agreed that the module would loosely follow the format below, with scope to revise and amend based on feedback from the cohort. The cohort would also undertake individual improvement projects alongside the programme and present them at the final programme event. • Knowledge capture, ensuring that some of the learning will inform future sessions and feed into wider organisational learning via case studies. On reflection I would have liked to embed knowledge management more firmly within the module, clearly highlighting to the cohort where knowledge management techniques were being deployed, and promoting the clear links between quality improvement and knowledge management. This is something that I will seek to address when planning for the next delivery of the module. Overall however, it was an excellent opportunity to work with colleagues from across NHS Health Scotland, bringing a range of knowledge and skills together to good effect. It also provided me with a variety of new experiences and development opportunities. I really enjoyed that session and thought it was one of the best we have had. Could tell you put a lot of effort into the planning of it and the practical sessions. Much appreciated! This project was important, as it is essential that managers have a clear understanding of how they can use improvement approaches and techniques to improve both their own work and that of their teams. Key to this is an understanding of how central knowledge is in understanding a situation, identifying a problem and measuring change, in order to ascertain whether there has been an improvement. Additionally, a broad understanding of knowledge management principles such as knowledge exchange, collation, organisation and mobilization and how they can support organizational improvement, will nurture a culture which values both knowledge and improvement, and understands the links and synergies between them. I just wanted to say how much I enjoyed working with you both on the management essentials improvement module. It’s been a real pleasure. For further information please contact Julia Green, Knowledge Services Team Manager, juliagreen@nhs.net.